Before anyone asks: no, that is not a leaked image. It’s just a mockup (or else that guy has some strangely long fingers). Honestly, what other images could I possibly use? I always get a little nervous any time I use the c-word, but this one’s coming from a reliable enough source, so I’ll give them the benefit of the doubt. Nikkei is one of the stock market index leaders in Japan, so naturally they’re privy to tons of investor-sensitive information that the public generally won’t get right away. 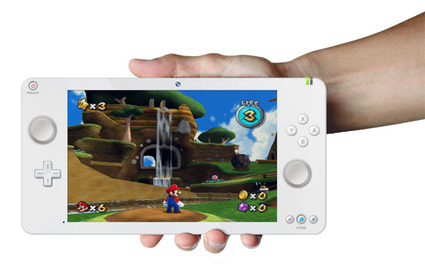 They’re reporting that the Wii successor’s controller does indeed have a 6-inch, tablet-based touch screen controller, and that it will have portable game streaming capabilities. Want to know what else they leaked out? Check the list below. This is all sounding very nice, and pretty soundly in line with the more prevalent rumors we’ve been hearing over the last few months. Are there any more surprises waiting to be revealed at E3? Probably – particularly in the software department, where Nintendo always shines. We also don’t know anything about what kind of online structure is going to be in place, or whether motion controls will still have a home on the new system. Now, of course, as I haven’t seen the report myself I’m still holding on to a little room for skepticism – but of course all of this stuff has been independently “confirmed” through other industry sources, so I want to really emphasize that it’s just a little skepticism. But I’m not too worried – I’ll know all the answers…in four days’ time.